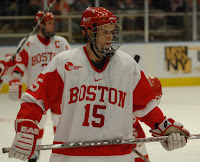 Senior center John McCarthy, who wears the "C" as co-captain of the 2008-09 Terriers, brings a history of leadership, intelligence and tenacity to BU. He's a top penalty-killer and faceoff guy who anchors the Terrier's checking. A 2006 draft choice of the San Jose Sharks and a two-time member of the Hockey East All Academic team, McCarthy recently participated in the fourth and final installment of our preseason player Q&A interviews. Q—Last season, leadership was in flux when the initial captain was suspended. How have Matt Gilroy and you, along with the "A" Brian Strait, taken steps to make certain leadership within the team is a year-long strength? A—Matt, Brian, and I have tried to stress the fact that we need more leaders on our team, especially among the upperclassmen. We are trying to emphasize the fact that just because you don't have a letter on your jersey does not mean you are not responsible for doing the right thing and making sure everyone else is doing the right thing. Q—How important is that on a team with 10 freshman and 5 sophomores, making the team about 60% underclassmen? A—As I said, even the younger guys that would not usually be depended on to be leaders have to step up and fulfill that role because we are in such a unique position of having the majority of our team be freshmen and sophomores. Q—You usually get the first call at forward when the Terriers are down two men. What are the keys for a successful penalty kill in that circumstance? A—We work on those situations a lot in practice and it is really about outworking the power play, blocking shots, and making sure you are forcing the power play to take low percentage shots. Also, when the opportunity presents itself, it is important to take short shifts to make sure the penalty kill has energy. Q—BU had one of the league's top power plays last season, but struggled on the penalty kill. What must the PK units do better this season? A—I think we just need to get back to the mentality of outworking the power play. We need to worry a little bit less about the "x's and o's" and a little bit more about beating the power play. Q—In his Coach's Mailbag interview, Jack Parker talking about taking "a new approach" to avoid the slow starts of recent season? Can you tell us what that will entail? What areas will get more emphasis as BU prepares for the IceBreaker to begin the season? A—We have changed a few things up this preseason and I think it will benefit us when the season starts. We have been having half team scrimmages with referees and I feel that will help to adjust to the game speed that we play at during the season. Also, we have increased our conditioning with morning runs which should also help us have a smoother transition into the season. Q—Your line was more productive on offense last year than the previous season. With potentially more offensive skill available this year, and potentially as your wings, do you see your role changing? What is that role? A—I plan on doing whatever I can to help my team win. I think once things get sorted out and guys start to recognize their roles, that is when our team really starts to develop and we can become successful. I need to make sure that I recognize my role on the team early in the season and do my best to fulfill that role and hopefully help to make my team better. Q—You joined Nick Bonino at San Jose Sharks development camp this past summer. What did that experience do for you? A—I thought it was a great experience just to see the guys that played in the NHL and what they do on a day-to-day basis to get themselves in the position that they are in. It was definitely a learning experience that I felt helped me become a better player. Q—What are your individual and team goals for the upcoming season? A— My goal is to set a good example for all of the younger guys as far as what we need to do to win games. I think we need to play better in the early part of the season instead of waiting until Christmas to play our best hockey. Hopefully we can win a lot of games and make a long run into the postseason. Q—Which of your teammates will surprise Terrier fans this season? A—I think Chris Connelly will have a big year for us. He works very hard and seems to recognize what he needs to do to help the team win. Q—What was the best moment of your first three seasons at BU?Winning my first Beanpot my freshman year was a lot of fun. Q—You were a standout quarterback at St. John's Prep prior to your USHL year and then entering BU. How much do you miss football? A—I do miss football in the fall when I watch it on TV, but I definitely don't miss the practices. Fourth-year pro Chris Bourque, trying to earn a spot on the Washington Caps, has been wielding a hot stick. He scored a goal and an assist against the Bruins in an exhibition game in Boston on Saturday. It was his second consecutive two-point effort in the preseason. Thursday, in the Caps 5-2 win over Carolina, Bourque earned first-star honors with a goal and an assist. In that game, ex-Terrier Dan Lacouture scored for the Hurricanes. The Columbus Blue Jackets assigned Brian McGuirk to their Syracuse Crunch AHL affiliate. Adrian Aucoin spent just one season as a Terrier before beginning a long NHL career. Aucoin was part of the freshman class (Steve Thornton, Mike Prendergast, Rich Brennan, Kaj Linna, Derek Herlofsky, J.P. McKersie) that won an NCAA title as seniors. Following standout years with the Canucks and Islanders and some down years in Chicago, Aucoin, who rebounded with Calgary last year, discussed the upcoming season with The Calgary Herald. Friday brought the sad news of the death of screen icon, activist, philanthropist and auto racing enthusiast/team owner Paul Newman. Within his remarkable roster of movie credits, Newman’s portrayal of player-coach Reg Dunlop in “Slapshot” remains a favorite of hockey fans. In an April 2007 post, we reported that Terrier captain and All-American Steve Stirling was an extra in the film and Newman would often join the extras between takes for a game of shinny. In several of the obituaries, it was pointed out that Newman claimed his success came less from natural talent than from hard work, luck and the tenacity of a terrier. Monday is Hockey East Media Day when the league coaches' poll will be announced. Also expected from BU this week are a season preview for the Terriers, a summary of the 10-man freshman class, a full television schedule and other news features. Hockey East has also announced a two-year television contract with ESNPU. This season's eight-game ESPNU schedule includes two BU games: Oct. 19 at UNH and Dec. 6 at Boston College. While the men's team's exhibition game with University of New Brunswick is a week away, Brian Durocher's women's team won its exhibition game with Dawson today in overtime, 5-4. Recap. The list of Jack Parker-coached Terriers who’ve made their mark in coaching is a lengthy one that includes, to name just a few, Terry Meagher (Bowdoin), Bill O’Neill (Salem State), Joe Sacco (AHL Lake Erie), Mike Sullivan (Bruins), Shawn McEachern (UMass Lowell) and Brian Durocher (BU-Women), and it continues to grow. Add Steve Thornton to the ledger. The Giants' roster has a decidedly Hockey East flavor. Besides the two ex-Terriers, former Maine sniper Colin Shields is doing double duty as a forward and team blogger. And UML coach Blaise MacDonald, a BU assistant on the '95 title team, has directed a pair of River Hawks, Bobby Robins and Andrew Martin, to the Giants to continue their pro careers. Thornton's Giants have won five of his first six games behind the bench. The first national preseason poll is out and the Terriers are ranked 10th. The USA TODAY/USA Men’s Hockey poll placed three Hockey East teams in the top ten (BC #1, UNH #7). The Terriers 2008-2009 schedule includes games with five of top 12 ranked teams and a possible sixth if BU faces the host team in the Denver Cup. 2009 recruit Max Nicastro (photo), playing his second USHL season, is the Chicago Steel’s top scorer after three exhibition games with 2 goals and a pair of assists. The right-shot defenseman from Thousand Oaks, Calif., was a third-round choice of the Detroit Red Wings in the 2008 NHL entry draft. The Steel begin play in the USHL Fall Classic on Thursday, however the team’s preseason highlight may have come ten days ago when the Steel faced off against the Chicago Blackhawks alumni in a charity game, which the junior club won, 11-4. Suiting up for the alums were Troy Murray, Grant Mulvey, Tim Kerr, and Steve Poapst, the current Steel head coach. One of two player-coaches for the alums was former Terrier captain, All-American defenseman, 1978 NCAA Tournament Most Outstanding Player and 1980 Olympic gold medalist Jack O’Callahan who went on to patrol the blueline in the Windy City for five seasons. John Curry got the start for the Penguins last night against Tampa Bay and stopped all 15 shots he faced in one period of play. Curry is expected to begin the season at Wilkes Barre-Scranton. Searching for a link to the '78 national championship game in the Sports Illustrated vault, a treasure trove of (mostly) BU sports video clips was found. The vast majority are Terrier hockey (Beanpots, 2006 HE title, Red Hot Hockey at MSG, etc.) with some hoops and soccer sprinkled in. On the third page, there's a real treat, especially for those who still mourn the demise of Terrier football. On a series of clips, you'll find game highlights of BU's remarkable comeback win in double overtime over Northern Iowa in the 1993 Div. 1AA Football playoffs, continuing the Terriers' then-undefeated season. Enjoy. The BU hockey family suffered two tragic losses this past week with the passing of a pair of unique individuals, accomplished alumni each of whose lives had a far-reaching impact. Both were taken far too soon. Last Sunday, BU journalism professor, author of numerous hockey books and former Sports Illustrated hockey writer Jack Falla died suddently at age 62. The Boston Globe obituary (check out the wonderful photo of Jack) provides a chronology of his career and illustrates his passion for both journalism and hockey). Numerous articles and blog posts that have appeared this week reveal that his loss is felt deeply among the student body and alumni as well as by his family and friends. Here are links to a few of them by journalists he mentored: 1, 2, 3, 4. Falla’s books on hockey include a series of essays titled "Home Ice: Reflections on Backyard Rinks and Frozen Ponds" and newly published “Open Ice: Reflections and Confessions of a Hockey Lifer.” A member of The Friends of BU Hockey, he also wrote about Terrier sports for BU”s alumni magazine, Bostonia. A personnel favorite was a profile of Carl Corazzini, captain of the 2000-1 team. A less widely known, but equally beloved figure was Meryl Herman , co-chairman of The Friends of BU Hockey, who died Wednesday after a long illness. Meryl, a Class of 1966 graduate, was a longtime board member of the Friends, an organizer extraordinaire who planned and quarterbacked the annual hockey banquet and was a devoted and kind friend to everyone connected to the BU program, both young and old. Our colleague cdral, who attended today’s funeral in Newton, reports that a large contingent of current and former BU players and managers were in attendance, as well as members of The Friends. Coach Jack Parker’s eulogy documented her strong commitment to the hockey program and how she been the force behind so many activities that supported BU hockey. Meryl had been voted co-chairman of The Friends with Paul Giandomenico earlier this year. An online guestbook for condolences and memories is here. The Chiiliwack B.C. Progress looks back at an eventful year for Terrier incoming freshman goalie Grant Rollheiser. Just 12 months ago, he joined the BCHL Trail Smoke Eaters, getting off to a slow start, but Rollheiser had a breakthrough season that brought a BU scholarship and made him a sixth round draft choice of the Toronto Maple Leafs. A Pittsburgh Post-Gazette feature updates us on former All-American goalie John Curry who earned All-Rookie honors at AHL Wilkes Barre/Scranton in his first pro season. Curry goes into the season as the number three netminder in the Penguins organization and will be looking for an opportunity to earn some NHL playing time. The Post-Gazette also reports on the recovery of Ryan Whitney from off-season foot surgery. Whitney, who won’t return to the Pittsburgh lineup until at least mid-November, is in the second year of a six-year contract with the Pens. Former Terrier defenseman Tom Morrow is back in North America after spending a season with the Hannover Indians in Germany. The 6’ 7” blueliner has joined the Anaheim Ducks’ ECHL affiliate, the Bakersfield Condors. Announcing the signing team officials indicated that Morrow would go to the camp of the Ducks’ AHL club, the Iowa Chop (is that a porkchop or like the Braves’ “Tomahawk Chop”?) and may find himself playing at both levels this season. The Terriers first official practice is set for two weeks from tomorrow, Saturday, October 4, with the exhibition game against the University of New Brunswick the next day, October 5. Captain’s practices, of course, are already underway. All of BU's regular season and playoff games will again be aired on WWZN-AM 1610 in Boston with Bernie Corbett and Tom Ryan once again handling the play-by-play and color duties. In addition, the Corbett-hosted "All-Access" program, covering all BU sports, will air weekly on WWZN this season with scheduled dates for the first semester listed in an BU athletics news release. With informal practices under way and the Icebreaker Tournament just a month away, we’ve asked Terriers head coach Jack Parker to answer ten questions about the upcoming season in our first “Coach’s Mailbag” session of the 2009-09 season. Questions were submitted by several blog contributors and other BU fans. Q—Matt Gilroy's return was welcome, but unexpected return. That suggests you felt the other returning four defensemen and two freshmen on the 08-09 roster were all going to be capable and deserving of regular shifts. Now with seven such defensemen, do you plan to use any kind of rotation to keep them all in the mix, or is someone eventually going to be odd man out? Conversely, being thin on bodies at that position, will you practice forward or two on D for depth? JP—Actually, if Gilroy had left, we had another right shot defenseman ready to come. Since Matt decided to return, that allowed the other guy [editor’s note: presumably Max Nicastro] to take another year of junior hockey and come in September of 2009 as was the original deal. We have moved forward Steve Smolinsky back to defense for practice purposes. Q—What type of powerplay set up will you use--an umbrella or the 2-point man system? With so much blueline skill, might it be different for the first and second units? JP—In all probability, one unit will have a left shot and a right shot at the point and the other unit will utilize two right shot points. Therefore, the units will have two different looks. Q—With the abundance of offensive talent on the blue line, do you anticipate having Brandon Yip playing forward on the powerplay? JP—Brandon Yip will be used upfront most of the time on the pp unit unless we lose a defenseman to injury. Q—David Warsofsky will be the third consecutive USNDTP captain to join the Terriers. To what do you attribute the ability to gain commitments from not just skilled players, but strong leaders? JP—We have had strong ties to the USNDTP for many years. Also, our guys were Eastern guys to begin with. Q—With BU having two talented but inexperienced freshman goalies, are you planning to start the season with a rotation or might one of them immediately seize the starting job? JP—Actually, Adam Kraus is in the mix as well, so the job is wide open. A rotation of two guys will most like be the way we go got the first few months with one guy out of the rotation. Q— With last season’s improvement on faceoffs and now the addition of another center with strong stick skills, will BU leverage that strength with more planned plays off draws? JP—We have always had numerous faceoff plays in all three zones. If we continue to win face-offs, the fans might notice the set-ups more often. Hopefully, we will continue to improve in this vital area. Q—Can you discuss the recent trend of slow starts by BU teams. The last time BU won more than half its first ten games was 2004-05 (7-3). The last exceptional start was in 2001-02 (8-1-1). How do you plan change that trend this season, especially with three strong Western teams visiting BU in October? Q—Last season’s team’s home record was just 10-7-1 and over the past two season, BU has won just over half its home games. In a very balanced league, what does it take to re-establish a significant home ice advantage? How much of that comes from a team mindset? JP—It is all team mindset. We have played better on the road with more quality efforts than we have at home. It’s a trend that also has occurred at Maine and BC. It’s a tough league but obviously we are more focused on the road or we take things for granted at home. Probably a little of both. We are working on it. Q—In the same vein, last season BU had just three home games in the first two months. This year, starting with the Icebreaker against North Dakota and Michigan State, you have nine home games in October and November. An opportunity or added pressure? JP—I would rather be home any time during the season despite what was discussed in the previous question. The only time it’s good to be on the road is when the students aren’t here. We should be better off starting out at home. Q—Which returning player is going to surprise BU fans this season? JP—If by surprise you mean make the biggest jump production wise, I’d say either Colin Wilson or Nick Bonino. They both had solid freshmen seasons but their upside is so great, they both could become dominant players. However, I am hoping that Chris Higgins, Brandon Yip and/or Jason Lawrence can do what Boomer Ewing did in his senior year. Some light is being shed on the reasons for Ethan Werek’s decision to leave his USHL team’s camp to sign with the OHL Kingston Frontenacs. An article in the Kingston Whig Standard contends that at Indiana Ice training camp, “the calibre of the league came into question when Ethan scored so many goals in an intrasquad game that he was asked to hold back,” according to his father. Pardon me for being cynical, but the USHL is recognized as the top U.S. junior league and is well-respected by NHL teams. In fact, an Indiana Ice player, John Carlson, was a first round choice in this past June’s NHL draft. Carlson, who had committed to UMass, has since joined the OHL London Knights. Werek had a change of heart, due almost solely to the fact this is Werek’s NHL draft year. One NHL scout said Werek is a solid top-10 prospect with the potential to move higher as the season goes along. Young Werek, who led Stouffville in scoring as a rookie last year, sees himself on the fast-track to the NHL, and rightfully so, given his size (6-2, 195) and skill level. BU fans can take a small amount of solace knowing that had Werek played in the USHL this season, he’d likely have been “one-and-done” at BU. "The Hockey News Season Preview includes an updated list of each NHL team's top ten prospects with a one-line comment on each one (disclaimer: I don't know their source for the lists but they normally consult with NHL scouts). Five current Terriers are on their team's list: "
Kevin Shattenkirk - #1 on Colorado's list of prospects: "Great skater moves the puck well." Colby Cohen - #4 on Colorado's list of prospects: "Hits hard and can contribute offensively." Colin Wilson - #2 on Nashville's list of prospects: "Power forward already has NHL body." Corey Trivino - #4 on NY Islanders' list of prospects: "Crafty playmaker bound for Boston University." Brian Strait - #4 on Pittsburgh's list of prospects: "Stay-at-home D-man captained USA at WJC." srsterrier pointed out that these five comprise 25% of BU’s game lineup. BU’s 2009 recruit class when standout forward Ethan Werek agreed to terms with the OHL’s Kingston Frontenacs, according to published reports, forfeiting his NCAA eligibility. Werek, who had been Kingson’s first round draft choice in 2007, elected to play last season for the Stouffville Spirit, where he teamed with incoming BU freshman Corey Trivino and also earned the OPJHL's Rookie of the Year Award. Whenever a recruit is a high major junior draft choice, as Trivino was, too, coaches are left holding their breath, worried about an outcome such as this one. We reported in July the announcement that Werek would play this season for the USHL Indiana Ice, a decision that left Terrier fans a bit more confident that Werek, a potential NHL first round draft choice, would eventually arrive at Agganis Arena. But it was not to be. The reasons for Werek’s change of heart have not yet been reported, however one report we received indicates there was disagreement within his family about which path to pursue. Werek’s reneging on his commitment leaves BU with no committed forwards in its 2009 class and one forward, South Kent School winger Wade Megan, in the 2010 class. Looking Back: Where are they now? If you didn’t catch Fluto Shinzawa’s article in the Boston Globe this past Sunday about former Terrier All-American Mike Grier’s thirst for the Stanley Cup and recovery from off-season surgery, here's another chance to do so. Grier has been working out at WBA. We have updates on a number of other former Terriers, beginning with Pete MacArthur, last season’s captain, leading scorer, All-New England and a second team All-American, who signed on with the Chicago BlackHawks AHL affiliate, the Rockford Icehogs. Mac, who finished his Terrier career with 147 points (18th all-time at BU), attended the BlackHawks development camp in July, leading to the AHL contract. Eric Thomassian (photo) has joined the Ontario (CA) Reign, the L.A. King’s ECHL affiliate that relocated from Texas. Thomo, who scored 21 goals for the Deggendorf Fire in Germany, was referred to the Reign by Kevin Schaeffer, whom we reported earlier this summer had received a qualifying offer from the Reading Royals, another King’s affiliate. Schaeffer, who spent part of last season with the Providence Bruins, is awaiting a tryout offer from an AHL team. Last winter we posted that Bryan Miller, playing for the ECHL Alaska Aces, had earned a spot in the league all-star game when a shoulder injury ended his season. Miller has recovered from surgery and re-upped with the Aces. Matt Radoslovich is preparing for his second season with the ECHL Trenton Devils following a two-year stint with the Quad City Mallards. 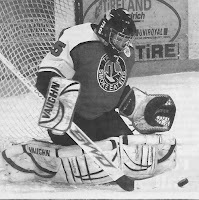 His Mallards teammate, the well-traveled Jason Tapp, will be stopping pucks for the IHL Kalamazoo Wings. Tapp spent last year with the Corpus Christi Rayz. Ken Roche is headed across the pond to play for ES Weilbwasser in Germany. Roche spent most of the past season with the AHL Lake Erie Monsters, coached by Joe Sacco. Gregg Johnson also will be in Europe this season.. He began last year with the AHL Bridgeport Sounders and finished in the DEL with the Frankfurt Lions, a rival of former Terrier captain and All-American Steve Stirling's Iserhorn Roosters. Another former BU captain, Mark Mullen, is entering his second season as an assistant coach with the USHL Cedar Rapids Roughriders. This past summer, Jack Baker and Brad Zancanaro (photo), a pair of tiny terrors in their Terrier days, coached a team of Massachusetts 14s that traveled to Sweden for an international competition. Zancanaro played for Florida (ECHL) last season. 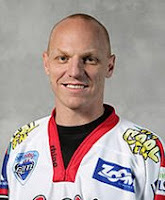 His twin brother Tony (ex-PC forward) is a teammate of Radoslovich on the Trenton Devils.